This article is about Franklin D. Roosevelt's themes. For other uses, see Four Freedoms (disambiguation). Engraving of the Four Freedoms at the Franklin Delano Roosevelt Memorial in Washington, D.C. In the 1930s many Americans, arguing that the involvement in World War I had been a mistake, were adamantly against continued intervention in European affairs. With the Neutrality Acts established after 1935, U.S. law banned the sale of armaments to countries that were at war and placed restrictions on travel with belligerent vessels. When World War II began in September 1939, the neutrality laws were still in effect, and ensured that no substantial support could be given to Britain and France. With the revision of the Neutrality Act in 1939, Roosevelt adopted a "methods-short-of-war policy" whereby supplies and armaments could be given to European Allies, provided no declaration of war could be made and no troops committed. By December 1940, Europe was largely at the mercy of Adolf Hitler and Germany's Nazi regime. With Germany's defeat of France in June 1940, Britain and its overseas Empire stood alone against the military alliance of Germany, Italy, and Japan. Winston Churchill, as Prime Minister of Britain, called for Roosevelt and the United States to supply them with armaments in order to continue with the war effort. The 1939 New York World's Fair had celebrated Four Freedoms - religion, speech, press and assembly - and commissioned Leo Friedlander to create sculptures representing them. Mayor of New York City Fiorello La Guardia described the resulting statues as the "heart of the fair". Later Roosevelt would declare his own "Four Essential Freedoms" and call on Walter Russell to create a Four Freedoms Monument that was eventually dedicated at Madison Square Garden in New York City. The Four Freedoms Speech was given on January 6, 1941. Roosevelt's hope was to provide a rationale for why the United States should abandon the isolationist policies that emerged from World War I. In the address, Roosevelt critiqued Isolationism, saying: "No realistic American can expect from a dictator's peace international generosity, or return of true independence, or world disarmament, or freedom of expression, or freedom of religion–or even good business. Such a peace would bring no security for us or for our neighbors. "Those, who would give up essential liberty to purchase a little temporary safety, deserve neither liberty nor safety." The speech coincided with the introduction of the Lend-Lease Bill, which promoted Roosevelt's plan to become the "arsenal of democracy" and support the Allies (mainly the British) with much-needed supplies. Furthermore, the speech established what would become the ideological basis for America's involvement in World War II, all framed in terms of individual rights and liberties that are the hallmark of American politics. That kind of world is the very antithesis of the so-called new order of tyranny which the dictators seek to create with the crash of a bomb. The Four Freedoms Speech was popular, and the goals were influential in the postwar politics. However, in 1941 the speech received heavy criticism from anti-war elements. Critics argued that the Four Freedoms were simply a charter for Roosevelt's New Deal, social reforms that had already created sharp divisions within Congress. Conservatives who opposed social programs and increased government intervention argued against Roosevelt's attempt to justify and depict the war as necessary for the defense of lofty goals. While the Freedoms did become a forceful aspect of American thought on the war, they were never the exclusive justification for the war. Polls and surveys conducted by the United States Office of War Information (OWI) revealed that "self-defense", and vengeance for the attack on Pearl Harbor were still the most prevalent reasons for war. In a 1942 radio address, President Roosevelt declared the Four Freedoms embodied "rights of men of every creed and every race, wherever they live." On February 19, 1942, President Roosevelt authorized Japanese American internment and internment of Italian Americans with Executive Order 9066, which allowed local military commanders to designate "military areas" as "exclusion zones," from which "any or all persons may be excluded." This power was used to declare that all people of Japanese ancestry were excluded from the entire Pacific coast, including all of California and much of Oregon, Washington and Arizona, except for those in internment camps. By 1946, the United States had incarcerated 120,000 individuals of Japanese descent, of whom about 80,000 had been born in the United States. The Roosevelt Institute honors outstanding individuals who have demonstrated a lifelong commitment to these ideals. The Four Freedoms Award medals are awarded at ceremonies at Hyde Park, New York and Middelburg, Netherlands during alternate years. The awards were first presented in 1982 on the centenary of President Roosevelt's birth as well as the bicentenary of diplomatic relations between the United States and the Netherlands. John Crowley's novel Four Freedoms (2009) is largely based on the themes of Roosevelt's speech. FDR commissioned sculptor Walter Russell to design a monument to be dedicated to the first hero of the war. The Four Freedoms Monument was created in 1941 and dedicated at Madison Square Garden, in New York City, in 1943. Artist Kindred McLeary painted America the Mighty (1941), also known as Defense of Human Freedoms, in the State Department's Harry S. Truman Building. Artist Hugo Ballin painted The Four Freedoms mural (1942) in the Council Chamber of the City Hall of Burbank, California. New Jersey muralist Michael Lenson (1903–1972) painted The Four Freedoms mural (1943) for the Fourteenth Street School in Newark, New Jersey. Muralist Anton Refregier painted the History of San Francisco (completed 1948) in the Rincon Center in San Francisco, California; panel 27 depicts the four freedoms. Artist Mildred Nungester Wolfe painted a four-panel Four Freedoms mural (complete 1959) depicting the four freedoms for a country store in Richton, Mississippi. Those panels now hang in the Mississippi Museum of Art. Allyn Cox painted four Four Freedoms murals (completed 1982) which hang in the Great Experiment Hall in the United States House of Representatives; each of the four panels depicts allegorical figures representing the four freedoms. Since 1986, the fictional Four Freedoms Plaza has served as the headquarters for Marvel Comics superhero team Fantastic Four. In the early 1990s, artist David McDonald reproduced Rockwell's Four Freedoms paintings as four large murals on the side of an old grocery building in downtown Silverton, Oregon. In 2008, Florida International University's Wolfsonian museum hosted the Thoughts on Democracy exhibition that displayed posters created by 60 leading contemporary artists and designers, invited to create a new graphic design inspired by American illustrator Norman Rockwell's Four Freedoms posters. Roosevelt's speech inspired a set of four paintings by Norman Rockwell. The members of the set, known collectively as The Four Freedoms, were published in four consecutive issues of The Saturday Evening Post. The four paintings subsequently were displayed around the US by the United States Department of the Treasury. Freedom of Speech, by Booth Tarkington (February 20, 1943). Freedom of Worship, by Will Durant (February 27, 1943). Freedom from Want, by Carlos Bulosan (March 6, 1943). Freedom from Fear, by Stephen Vincent Benét (March 13, 1943; the date of Benét's death). 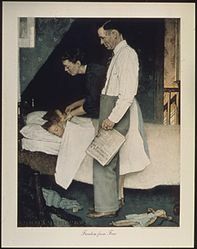 Rockwell's Four Freedoms paintings were reproduced as postage stamps by the United States Post Office in 1943, in 1946, and in 1994, the centenary of Rockwell's birth. Freedom from Fear: The American People in Depression and War, 1929–1945, a Pulitzer-winning history of the era. The Free Software Definition is often called "the four freedoms" within the free software community in reference to the speech and fundamental principles. World War II Victory Medal (United States), which includes the Four Freedoms on its reverse. ^ Inazu, John D. (2012). Liberty's Refuge: The Forgotten Freedom of Assembly. Yale University Press. ISBN 0300173156. ^ a b "FDR, "The Four Freedoms," Speech Text |". Voicesofdemocracy.umd.edu. January 6, 1941. Retrieved August 14, 2014. ^ Korematsu v. United States dissent by Justice Owen Josephus Roberts, reproduced at findlaw.com. Retrieved September 12, 2006. ^ Roosevelt, Franklin Delano (1941). Four Freedoms speech – via Wikisource. ^ "About the Park". Four Freedoms Park Conservancy. Retrieved July 23, 2014. ^ Lucas, Sherry (May 21, 2014). "Richton mural donated to Miss. Museum of Art". Hattiesburg American. Retrieved June 1, 2014. ^ "Thoughts on Democracy". Wolfsonian FIU. 2008. ^ On February 20, 1943; February 27, 1943; March 6, 1943; and March 13 1943. ^ Booth Tarkington’s ‘Freedom of Speech’, The Saturday Evening Post, January/February 2009. ^ Will Durant’s ‘Freedom of Worship’, The Saturday Evening Post, January/February 2009. ^ Carlos Bulosan’s ‘Freedom from Want’, The Saturday Evening Post, January/February 2009. ^ Stephen Vincent Benét’s ‘Freedom from Fear’, The Saturday Evening Post, January/February 2009. Wikimedia Commons has media related to Four Freedoms. "Franklin D. Roosevelt Four Freedoms Park"